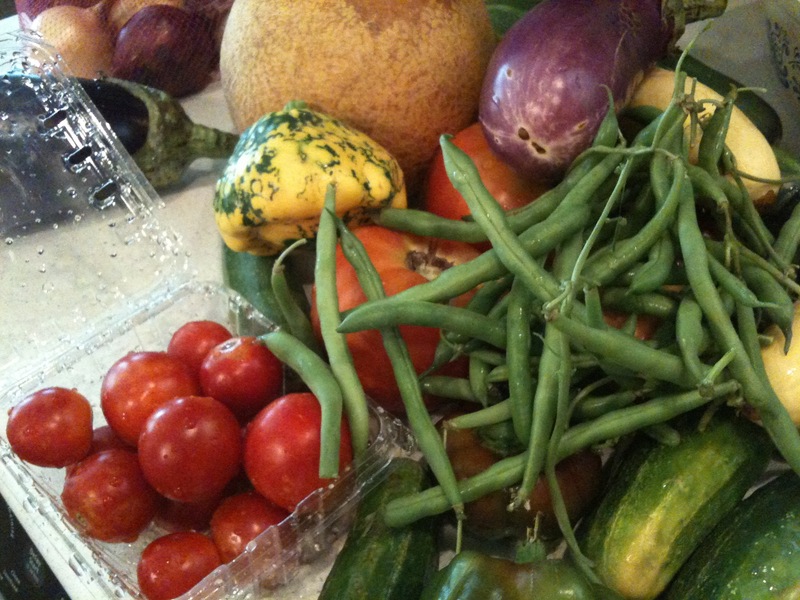 A quick run-down of what we got in the box today: basil, parsley, eggplant, tomatoes, cherry tomatoes, peppers, assortment of hot peppers, yellow squash, zucchini, other summer squash, cucumbers, pickling cucumbers, green beans, onions and a melon. I am excited because I can see so many lovely meals coming together – grilled peppers and squash, salsa, eggplant lasagna, tomato & mozzarella sandwiches, etc. Icing on the cake? No greens to wash! I am grateful that I will not be spending my evening cleaning and storing greens which is, by far, the most labor-intensive part of eating fresh-from-the-farm. In a matter of weeks I will be missing all those winter greens, but, for now, I am beyond pleased because it’s not yet time for dinner and all the produce is washed and ready to be stowed away.